Well, Shiver Me Timbers! Another Game Signing on the Horizon! Avast ye scurvy seadogs – Hoist the mizzen mast and set course for Germany! Our third game is 99% of the way to being signed with a *major* player in the industry – major as in the publisher of this year’s SdJ winner, “Kingdom Builder”! That’s right, folks! Jay and I have signed “Swashbucklers”, our game about carving out your place in the annals of pirate history on the rolling seas, with Queen Games. The Queen name is synonymous with high quality and award-winning games. This is a great partnership, as we feel that Queen will give this game the artistic treatment and wide distribution that Swashbucklers deserves, though I am somewhat sad to see the cute anime-style Pirate Girls we’ve been using as placeholders go. It will be extremely interesting to see the difference in the development, marketing, and distribution process between a North American and a German publisher. So, weigh anchor and set sail with us as we embark upon a new voyage full of adventure! 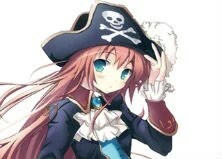 NOTE: We are not 100% positive the pirate theme will be retained, but we’ll keep you updated here! So the art is done and the game has been sent to the printers, now you can sit back and let the money roll in right? Nope – not yet! In an older post we talked about how with book authors they are expected to promote their book, while in the board game world there isn’t the same expectation. That might be true, but I think it’s safe to assume you’re as interested as the publisher is in ensuring your game is a success! There are many things you can do to help promote your game. Let’s take a look at some examples, though this list is certainly not exhaustive. 1) Designer Diaries: Many gamers love to read about how a game came to fruition. Write up your story of how it came to be published. Remember that most people probably haven’t played the game when they read your designer diaries, so don’t refer too much to rules that they won’t understand. Once you’ve completed writing them, ask your publisher if they would like to have it or if they’d prefer if you distributed it. If you’re on your own, no worries, that’s what www.boardgamegeek.com is for! Post it in the forum or ask Eric Martin if he’d be interested in sharing it in the News section. Once it’s posted then get your friends and family to head on over to read it and give it some thumbs to get it started. (thumbs are the equivalent of the ‘Like’ button of Facebook). Here’s the Designer Diary for Train of Thought and here’s the Designer Diary for Belfort. For Belfort we decided to mix it up and instead of just talk about the history of how it came to be, we interviewed all the people responsible for bringing the game to fruition: The playtesters, the developer, the artist and the printers! 2) Leaking art: work with your publisher before leaking any art as they might have a proper marketing plan on how to release it. Again, use bgg.com and get those thumbs going again. If you get enough attention then it will make it to the front page of bgg.com in the images section. We had our artist Josh make up some fun promo images using the art from the game! 3) Blog: Blog about your experiences with game design. It’s one of the reasons I started this blog. Many blogs are devoted to how to make your blog successful so I won’t go into that detail here. Rest assured that pretty much any press is good press! We even did a video ‘interview’ describing the history of Belfort! 4) Leaking the rules: Somewhere within the last month before your game is released to the public you should get your publisher to leak the rules online. This could either be on their website or on bgg.com. Then do whatever you can to promote that the rules are available. You know – Twitter, Facebook – the usual suspects. 5) Local PR: There are a few things you can do locally. First is to ensure your local game stores are aware that the game is coming. If the publisher has created a sales sheet for your game, print them out and give one to each game store in your neck of the woods. If one doesn’t exist then ask the publisher if you can make one on your own using art from the game. Generally any publisher will be happy for any extra promotion that you can do. A sales sheet is similar to the sales sheet we talked about in Step 14, but it’s for a different audience! The audience for this sales sheet is for retailers and customers! It will have art of the finished box and hopefully a picture of the game in progress with many of the components. There should be a short description and enough flavour text to get people intrigued. You can also make a press release and send it to your local TV, Radio and Print establishments. If you spin it as a ‘local citizen achieves dream’ or something like that, then you stand a good chance at getting some media attention. If you do get any media attention, then ensure you forward it to the publisher. If it’s appropriate then they can add it to their website. I’ll devote another post on how to write up a good press release. Once the game is out, the PR doesn’t stop. It’s up to you to go to as many game stores as you can and show the owners how your game plays. Hopefully they’re carrying your game (remind them that since you’re local, there will be more demand here), and now that you’ve given them a tutorial, or even played the game with them, then they’re much more likely to recommend it to others (assuming they like it!). There’s a store in my city of Vancouver that I showed how to play Train of Thought and they liked it so much that they recommend it to a lot of customers and it ended up being one of their best sellers last year! Organize ‘Meet the Designer’ days at your local stores. Much like an author will do a reading or a signing at book stores, you can do the same things at game stores. Help them advertise it however you can – possibly be including it in your press release. These can be a great way to show your game to people. 6) Conventions: If the publisher is going to a convention and you can afford it, then ask if you can come too (heck, first ask if they’d like to pay for your flight or hotel!). I can’t imagine a publisher turning down having a designer at their booth helping promote their game. 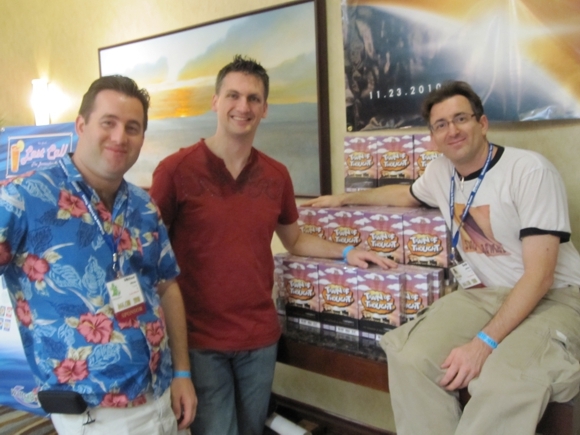 I attended BGG.con when Train of Thought was released and spent most of my time at the Tasty Minstrel booth showing people how to play the game all week. 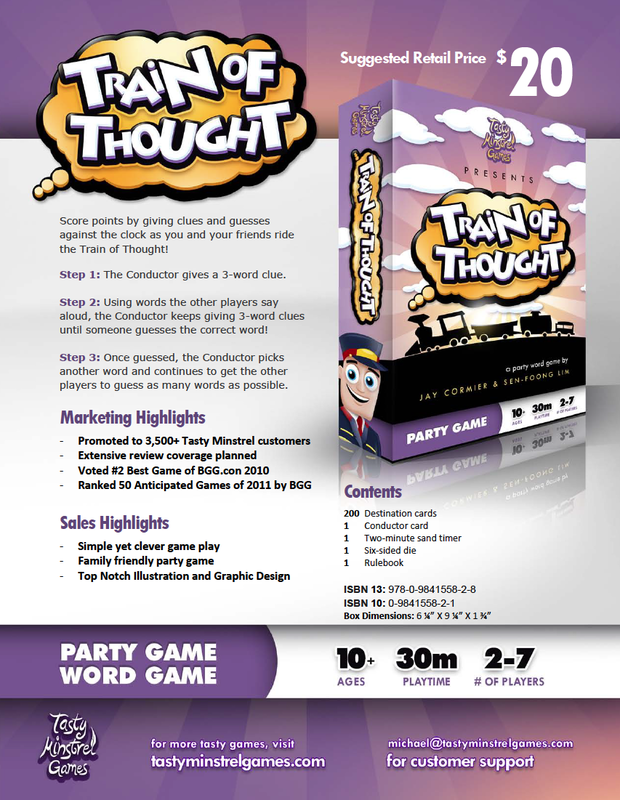 It paid off because Train of Thought ended up being the second highest rated game at the convention! 7) Reviews: The publisher should be responsible for sending out review copies, but there’s nothing stopping you from helping in whatever way you can. I’ve sent one of my own copies to a reviewer in order to get a timely review. We’ve also sent review requests that we get (since we’re the designers, some reviewers contact us) to the publisher. Once you do get a review, assuming it’s positive, then do whatever you can to promote that review! Post it on your blog; send it to your publisher so they can post it on their site; link to it on BGG.com. 8) Awards: Again, this is up to the publisher to submit the game for various awards. You can help by listing awards for which you think you have a better chance at winning and forwarding them to your publisher. We were fortunate enough to win the Dice Hate Me Game of the Year award and now that victory is on the front of the box for the second printing! 9) Above and beyond: Sen and I will always go above and beyond expectations when trying to promote our own games. For Train of Thought we filmed a 45 second video that gives a nice overview of how the game is played. We got some actor friends, and some videographers and shot and edited the video, then Sen added the music since he’s talented that way! For Belfort we did a different type of video and enlisted the assistance of one of our friends to help us animate it. Also I worked with another friend of mine and we wrote a 10 page comic book set in the world of Belfort. We’ve paid an artist out of our own pocket to professionally illustrate it. Of course, we got permission to do all of this from the publisher first! As you can see there are many ways in which you can help promote your game, and why wouldn’t you?! It might not be a strength of yours (heck, you’re a game designer not a marketing major, right? ), but it can only help you to learn about some of the things you can do to increase the potential of your game becoming a hit! So that brings us to the last step in this blog! That doesn’t mean we’re done though. We’ll be adding more stories and lessons we learn along the way, which will probably mean tweaking or adding some steps here and there. We haven’t even talked about Kickstarter yet, and with a new game of ours hitting Kickstarter soon – I’m sure we’ll learn a lot from that! And who knows, maybe we’ll actually self-publish a game or two in the future! Thanks for reading so far!